Keep your cat happy with Hill's Science PlanTender Chunks Multi-pack. Each pouch is a complete food containing the right combination of vitamins and minerals to keep your cat in the very best of health. Hill's Science Plan unique Immune Support Formula (ISF) is a powerful blend of antioxidants and vitamins that work together to support the immune system. with Turkey (minimum 4%): Chicken, wheat flour, turkey, pork, cellulose, calcium sulphate, DL-methionine, dried yeast, vegetable oil, syrup, taurine, vitamins and trace elements. Excellent apart from limited selection. Our cat Benjie is fed up with the chicken so could do with more turkey. Also he likes the fish in the meat and fish selection. Can you do more variety. t was delivered on time and packed very well. Our cat, a Burman, although he looks like a Siamese, went through a stage of having upset stomachs but as soon as we started him on Science Plan food he has thrived. He is 9 years old and does seem very healthy now. We also buy him the dry food for Siamese older cats which he loves. Medicanimal send the food quickly and is well packed. My wife ordered the dry food last time and ordered the very large bag so it will last for a very long timeespecially as he eats the wet food as well. Brand recommended by local vet, cheapest price I can find. Cat will eat all flavours, however does prefer the chicken flavour. 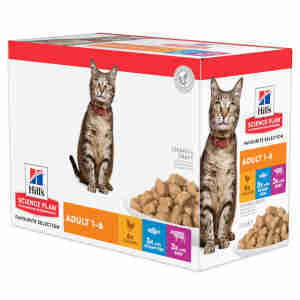 My cat loves Hills food, both the wet pouches and the dry crunchy variety. l work on the basis that cats know what they like regardless of what the manufactures like to claim ! My cat loves the food, but I was a bit disappointed to see that only the chicken pouches have approx. 35% meat and all the others only 4%, which is no more than any supermarket cat food. For this reason I find it a bit over priced.